Sankt Kjelds Plads is in a densely-built area of older apartment buildings about 4 kilometres directly north from the city hall. Many of the buildings here date from the 1930s but there are large modern office buildings and large and relatively recent industrial buildings and a large supermarket to the west. The area has a distinct urban character with relatively wide streets but little planting and not just on street parking but also fairly heavy through traffic. From the air you can see that most of the large apartment blocks have extremely pleasant courtyards with planting but the real problem for this area is that climate change has meant occasional but very destructive flooding from sudden rain storms with traditional street drainage unable to deal with surface water on the streets and with rain running off the roofs of the large buildings. The solution has been to put in fast-flowing storm drains, surface channels to take water away to tanks or sumps where it can be controlled, and, where necessary, filtered and then released into the drainage system but at an appropriate rate. These sudden storms may last for only an hour but in that time there can be a depth of 30 centimetres of water across the road that stops traffic, floods basements and ground-floor apartments and businesses and takes road-level pollution through the drains and to the harbour and the sound. Along with this hard landscaping of drains and surface gullies, the other solution is extensive planting that absorbs rainfall - apart from the most severe storms - and adds considerably to the amenity value of the street scape. Here at Sankt Kjelds Plads, seven roads converge at what was a very large traffic round-a-bout. That was planted with shrubs and trees but it certainly was not a place to sit. In fact, with the heavy traffic, it was not a place where many people even cut across. With the current scheme, small areas of pavement in front of the buildings have been pulled forward and the traffic discouraged and the round-a-bout reduced significantly in size. The new areas are densely planted and have pathways curving through them with seats . Sunken areas will flood when there are storms, to act as holding tanks, but have planting that will cope with short periods of partial submersion. 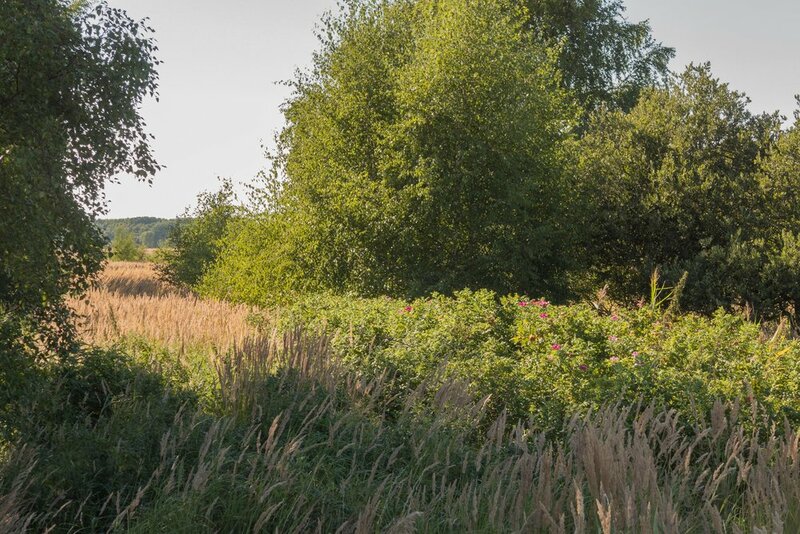 This will be the first full growing season for the trees and shrubs and ground cover so it is not fair to judge the scheme until everything becomes more established but already the transformation is obvious. This large open space links through with the climate-change landscaping of Tåsinge Plads, about 85 metres away to the east, and the main north south road through Sankt Kjelds Plads - Bryggervangen - is also being planted to form a green corridor from the large park - Fælledparken - to the south and continuing through to an open area and pond to the north beyond Kildevældskirke. 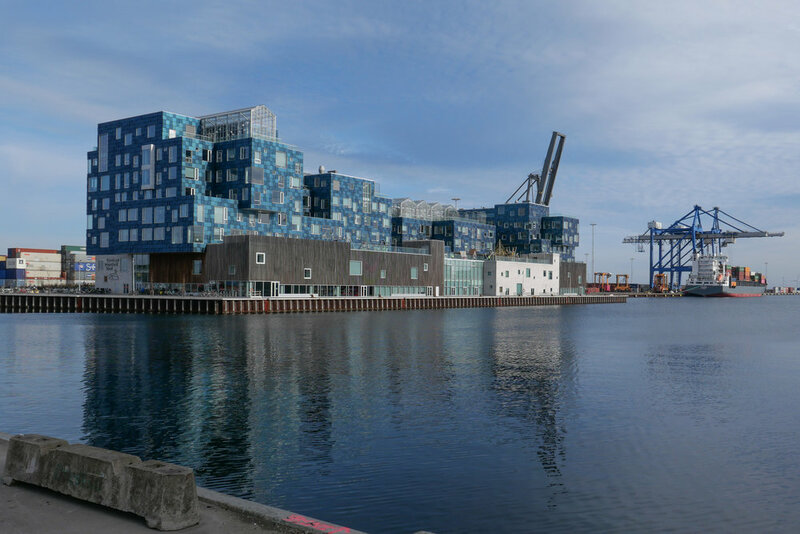 The large building to the east of the new metro station at Orientkaj - on the north side of the dock - is the new Copenhagen International School designed by CF Møller and completed in 2017. 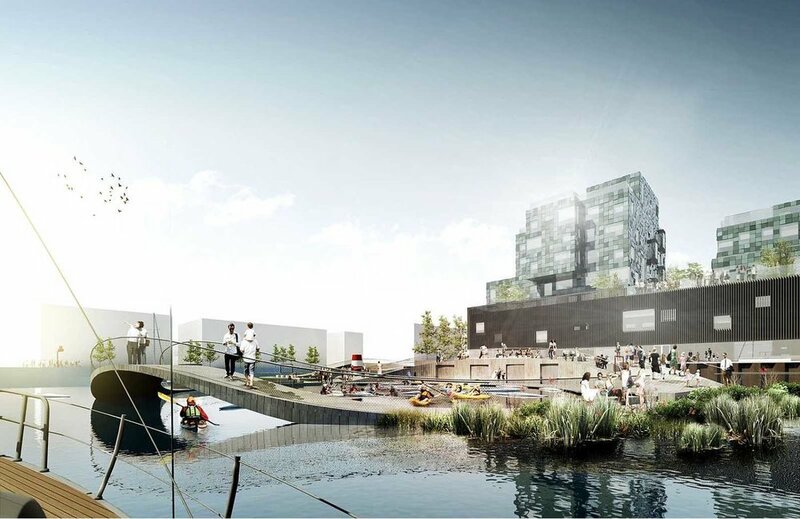 The scheme for swimming and water sport facilities is also by CF Møller. When the first stage of new metro line M4 out to Nordhavn opens then the trains will leave the circle line at Østerport and head out towards the harbour and, after a new station at Nordhavn, will climb up onto elevated track and a new station at Orientkaj. Here, as the trains pull into the station, to the right, looking east towards the sound, there will be a view down one of the largest docks in this part of the harbour with a line of large brick and concrete warehouses along Orientkaj itself … most dating from the second half of the last century and most bonded warehouses. These face across the dock to the new Copenhagen International School designed by CF Møller and completed in 2017. 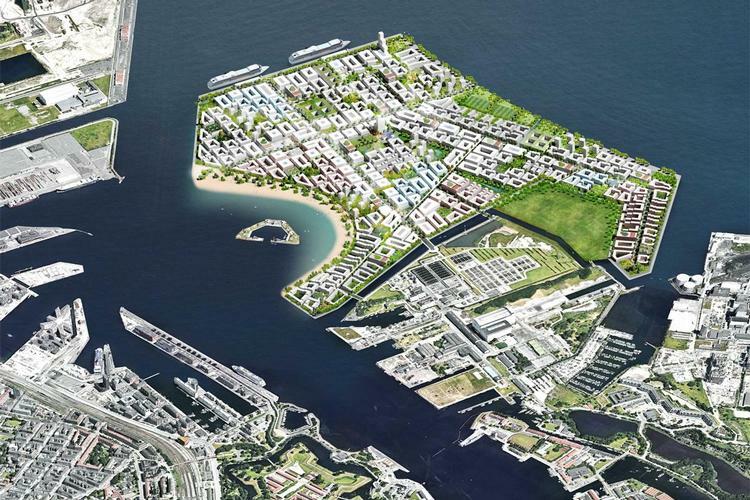 CF Møller have designed a scheme for the dock itself with a series of islands and boarded walkways in front of the school for swimming areas, an area for water sports, - including kayak polo - and changing rooms and a sauna with facilities to be used by the school but also by the local community. The impressive scale of the dock will be broken and the area takes another step away from its immediate past with nearly all evidence for the container port - the very reason the dock is here - lost but, and again it is a big but, it is schemes like this that will bring at least some nature back down to the quay side and will make the water a strong part of life in this area rather than simply a dramatic backdrop. Out of Office was established by the landscape architects Adam Roigart and Martin Hedevang Andersen who both trained in Copenhagen. They work on urban landscapes on public streets and in courtyards in the city and use prototyping to test ideas and to understand and to explore user needs and the users are involved in the construction work to establish a strong sense of ownership. Materials are recycled and for the urban garden in the staircase gallery at DAC (The Danish Architecture Centre) they are growing zucchini in bricklayers' buckets on recycled pallets. The plants will be cared for by local school children. The Out of Office on-line site has photographs of their projects including courtyard gardens for apartment building on Jagtvej and Sjælør Boulevard in Copenhagen, a Winter Pavilion, and a street garden in Krusågade in Vesterbro. The garden at DAC has been set up with the Klima 100 exhibition in the gallery at the next level down. On the staircase at DAC (the Danish Architecture Center) there is currently a small but important exhibition that was initiated and funded by Realdania. 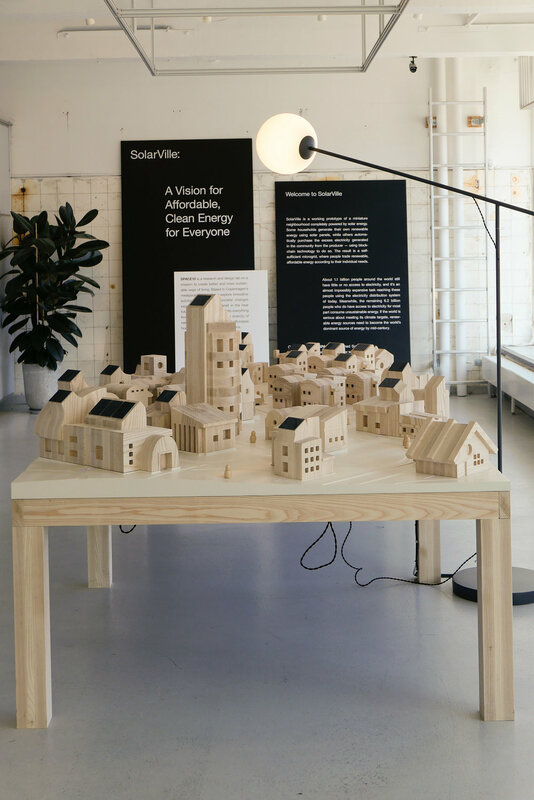 Eighty two of the 98 municipalities in Denmark submitted projects that tackle problems caused by climate change From those solutions 100 were chosen for publication in Klima 100 2018 and a selection are shown here in the exhibition. These examples confront a range of problems caused by adverse effects from changes in the climate. The best solutions were implemented at a local level and involved local communities but these projects can be adapted or scaled up to be implemented more widely … locally, regionally or globally. All the projects have been judged against the seventeen Sustainable Development Goals of the United Nations. What can be seen here is not just an impact in the way these solutions mitigate potentially serious and destructive problems but, at the same time, they can be seen to improve our built environment and can make positive differences to the way people live. For some of these problems there are relatively straightforward and obvious solutions - so, for instance, by planting more trees or replacing hard surfaces with grass to control the run off of surface water - and some solutions employ existing technology while others require imagination and ingenuity to reverse the impact of a man-made environment A good example of this is where former streams and water courses have been reinstated where they had been taken down into culverts and drains or where natural wetlands are restored to manage drainage. There are gains where nature has been brought back into cities and particularly where children are encouraged to understand how food is produced and to develop a positive and more informed attitude to the natural environment. Other solutions have focused on encouraging people to change their behaviour. 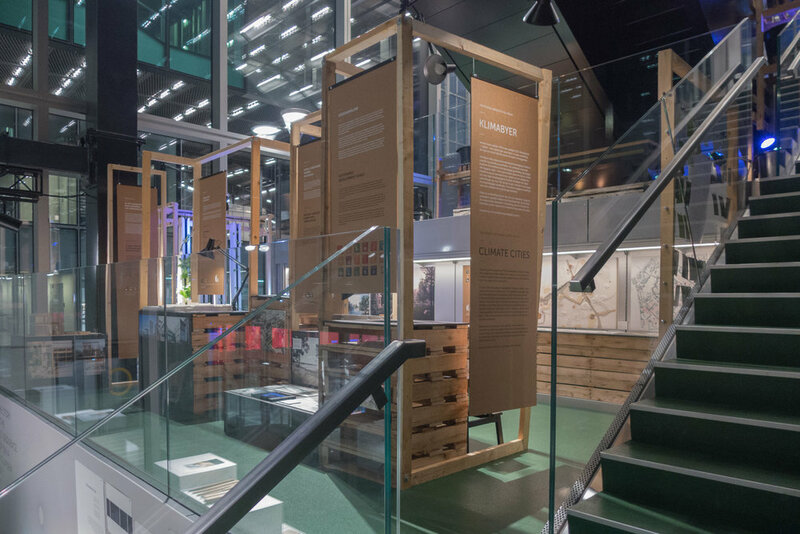 Recycling should no longer been seen as optional or as a chore and one of the projects featured in the exhibition has focused on how we can up-cycle more by using new facilities at city waste centre that can help people repair rather than dump possessions that are broken. In all this, at so many different levels, applied design has a crucial role. Headings below are taken from the information panels at the exhibition but are also active links to a relevant page on the Global Opportunity Explorer Klima goexplorer site and the numbers refer to the page in the publication Klima 100 2018 where the project is described and illustrated. The new City Hall in Middelfart has set new standards for the proposed life-span of its building materials and for energy use and water consumption both through the construction work and now when the building is in use. Solutions here may now seem obvious - so offices and functions spread around the town have been pulled together into a single location; floors use recycled wood; the building has 700 square metres of solar panels on the roof; waste heat is transferred to the district heating system and waste food goes to make natural gas - and together they are clearly effective. But perhaps what is more important is that the appearance of the building is of a thoroughly modern construction where there is no compromise of modern aesthetics. To put that another way, this building shows that nailed on old planks and chunks of moss and weeds on the roof are fine if that is what you want but it is not obligatory to achieve the very best green standards. This is an important project for Copenhagen where the city has a substantial number of well-built apartment blocks that date from the 19th and 20th centuries although these may not be arranged in the best way to provide an arrangement of accommodation that people now expect and almost-certainly do not come up to current standards for insulation or for good natural light or for energy use. This block on Gammel Jernbanevej in Valby was constructed in 1899 as purpose-built apartments with shops on the ground floor. The location is good, close to a railway station and in a pleasant street, and the building materials are durable but the apartments are small, lack bathrooms and the indoor climate is not good. The aim of the renovation is to preserve historic features but optimise natural daylight so a new glass façade will be constructed out from the courtyard side to form a climate screen that faces west. This will add 10 square metres to each apartment and, with triple-glazed folding screens and flexible glazed sliding screens, on the line of the present back wall, that space could be used like a large balcony in the summer but during the winter will be a warm and well-lit extension of the living space. An extra floor will be added to the block - to generate financial returns - and solar panels will be added on the new roof. This is a new-built residential neighbourhood in Lisbjerg about 7 kilometres north of the centre of Aarhus. New buildings have been designed to reduce environmental impact and citizens have been involved. 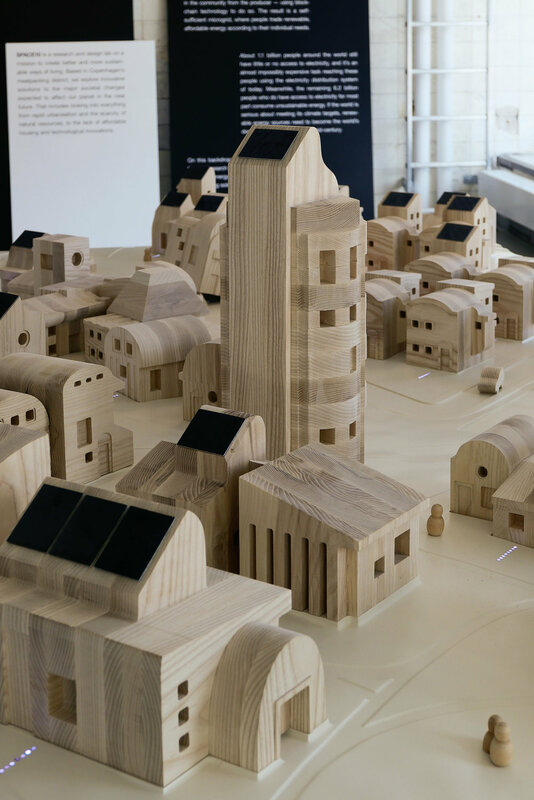 The area will develop over 60 years and the municipality has produced a long-term plan for sustainability and has produced “inspirational catalogues” to guide architects and builders working on the next phases. Building density is high and commercial buildings - and with them employment - have been brought back into the residential areas to reduce distances to travel to work or school. Water is collected after downpours and is filtered through limestone for flushing toilets and washing clothes and that reduces the use of treated drinking water by 40%. Projects like this show that we have reached an important turning point in our approach to climate change and sustainability. For many of the first solutions, the focus had to be on adapting to the problems - so retrofitting solutions - but for new buildings we can now be proactive. Impact Farm is a two-storey greenhouse that was installed in Nørrebro in Copenhagen in 2016. Intense cultivation on the top floor can produce between two and four tons of leaf green a year that is sold to local restaurants and cafes and the ground-floor space can be used for work and recreation including education workshops and food festivals. Rainwater is collected and recycled so growing food consumes 70-90% less water than a regular farm. Components are pre fabricated and the greenhouse is built around a shipping container and after 15 months it was packed up and moved on to a new site. Schemes like this have a vital role in helping children in towns and cities understand and appreciate how their food is produced. A new area of park and extensive urban garden has been laid out around the Marselisborg Centre in Aarhus with a focus on biodiversity and with integrated wetlands that utilise rainwater both for nature and for children so they develop a positive understanding of the natural world through play and exploration. Schemes like this are changing radically our preconceptions of what urban landscaping should look like. An imaginative scheme for a courtyard of 3200 square metres at the centre of an existing apartment building. Many of these large courtyards in the city simply have grass or low maintenance hard surfaces but neither deals well with the heavy rainfall from storms. In this courtyard, a "climate wall" built with recycled concrete will create a temporary lake to hold back water when there is a storm - in a heavy storm in Copenhagen enough rain can fall over a few hours to flood the ground floor and cellars of buildings, flood streets and overwhelm and damage drains and sewers. To control storm water by holding it back on the surface, rather than letting it surge immediately through storm drains, is now described as a "blue solution". Here the planting, described as "biomimicry", is closer to true or wild nature and, again, schemes like this are changing attitudes and expectations about planting in urban landscapes. More information about Fremtidens Gårdhave / Courtyards of the future can be found on the site of the Lendager Group. In this landscape project in Vejle, Jutland, rain water is held back as it drains down into the fjord. This is another good example where climate resilience, over a large area, not only creates an attractive new landscape but also creates popular and well-used space for physical activity. Le Mur / the wall protects the harbour of Lemvig against rising sea levels and destructive high tides. The solution here has been to build a concrete wall in sections with steel gates to close gaps that normally give access to the water. 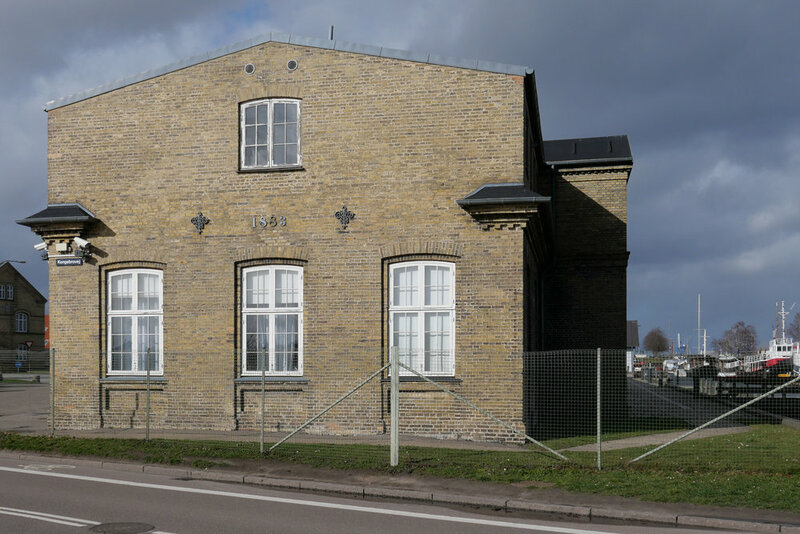 A former paper factory - Maglemølle in Næstved - is now a centre for green companies that recycle and upcycle materials including the collection and sorting of glass by Reiling Glassrecycling that is then reused by Ardagh Glass Holmegaard.